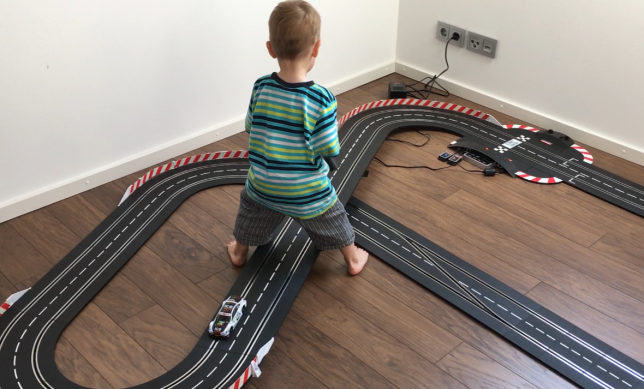 If you’re a returning visitor of my blog (welcome back, by the way), then you probably know how much I love playing with our race track together with my 3 year old son Benni. 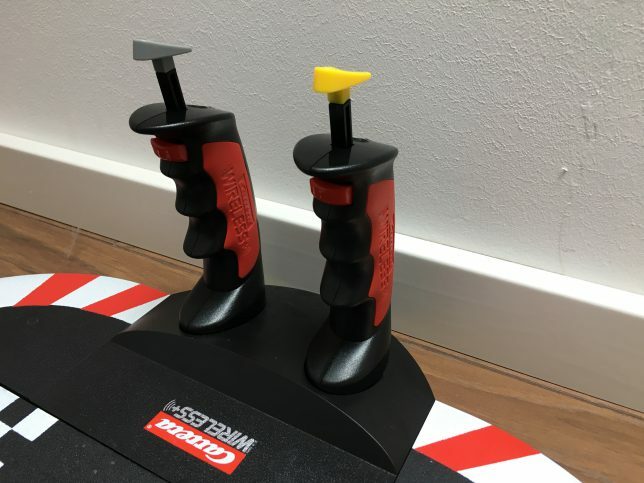 Maybe you even remember how I mentioned this before in my article about Top 10 Toys For 3-Year-Olds And Their Dads: Carrera Slot Racing Sets make an awesome toy for dads to connect with their kids. Simply put, slot car racing means that you race little model cars around a race track inside your living room. While RC cars are bigger, can be moved around freely and need a battery to run, slot cars are guided around the track by little groves in the track from which they also receive their power. Slot cars are held by a slot in the tracks. They receive electric power through sliding contacts. 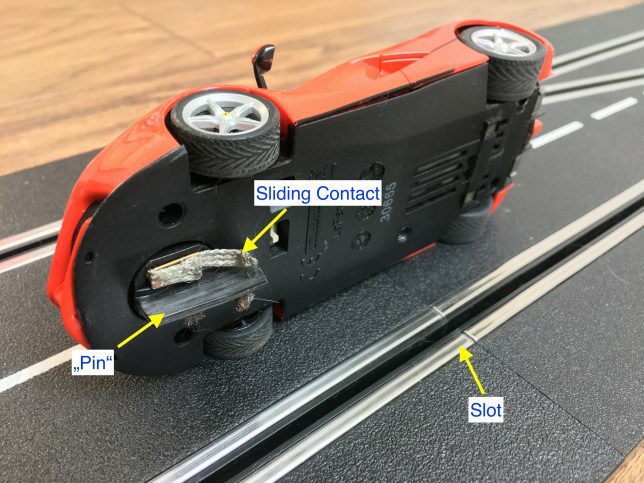 As the player, sorry, the DRIVER your job is to control the speed of the slot car so that it runs as fast as possible, without “deslotting” in curves and corners (i.e. being forced off the track). That’s usually done with a remote control that is either wired or wireless, depending on the slot car system. 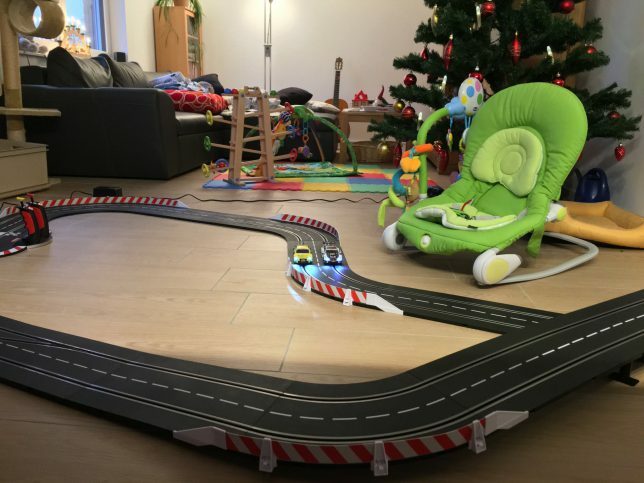 Now, this probably sounds a bit crazy, but: I bought our slot car track when Benni was just 6 months old (technically, I gave it to myself as a Christmas present and my son was a welcome excuse to sell the idea of this purchase to my wife). 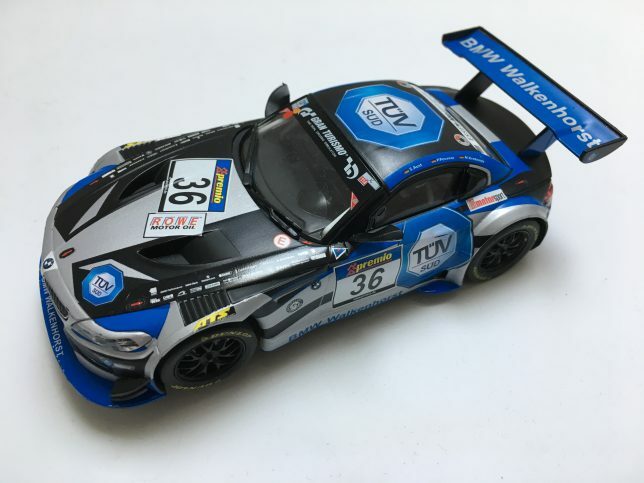 But it really paid off: When Benni was just six months old, he loved watching my wife and me race these little slot cars around the track: They are colorful, they are fast and they have blinking lights. That’s awesome for kids (and for us dads, obviously)! When Benni turned 2 years old, he was already able to ACTIVELY race together with me: The controls are really simple to use, and if you buy the right system, you can really scale it to fit all ages. That way it’s a toy that grows together with your child: They can start playing at the age of just 2 years old and will still be challenged at the age of 34 (that’s definitely true for me). All with the same toy! Now Benni is 3 years old: He knows how to turn the entire system on, he knows where to find the cars and how to insert them into the track. He also knows which controller controls which car! Besides the fact that I find this very impressive for a 3-year-old, it also means that (besides the action-packed races that we share together) every now and then he plays all by himself, which gives me and my wife some additional spare time. That’s great! With that being said, the high price tag that most slot car sets carry doesn’t seem so bad any more, the same is true for Lego: If a toy is high quality and offers value and fun for years to come, it is worth investing a good amount of money, instead of buying cheap; and buying twice! Alright, so now that we understand what slot cars are and how they work, and why it is really cool for kids, let me explain which slot car system I prefer and why. 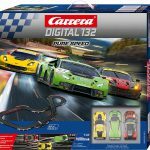 Back in 2015, I decided to purchase a Carrera Digital 132 Slot Car Set. 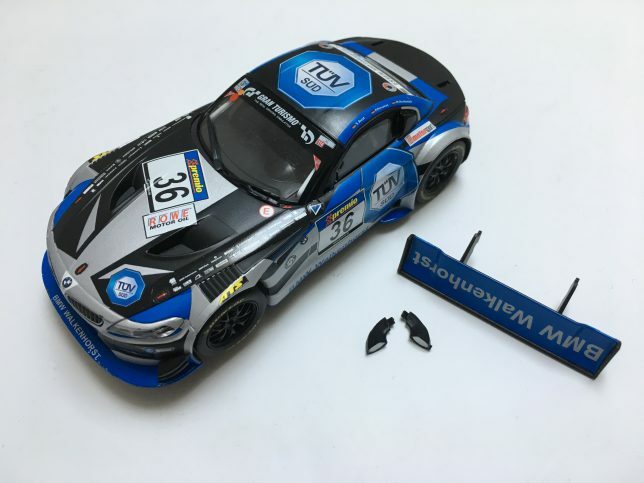 The Austrian company Carrera is best known for their high-quality slot racing sets and they have a long, long history of making these toys. Their tracks, cars, controllers and internal electric circuits are very well made. The systems are expandable and the company regularly adds new features (like wireless controllers, app support, Bluetooth connectivity etc.). Carrera GO is the company’s cheapest system. It’s really designed as a toy, nothing more: It’s not really expensive, but it also doesn’t last very long. Also, it is pure analog, which is a BIG disadvantage when it comes down to playing with this toy, especially with little kids. That may sound counter-intuitive: Why would a toy aimed at adults be better for young kids than the Carrera GO sets, which are specially made for children? We’ll get to that. As the name suggests, the Carrera Digital 132 sets are fully digital systems with a scale of 1:32. It comes with a few, but very important advantages compared to an analog system such as the Carrera GO (or Carrera Evolution). We’ll get into the details below. Now, you may think that you don’t need such a high tech toy for a kid: Going digital is for enthusiasts only!? Why would I need that if I just want to have some fun with my kid? And yes, the pricetag is hefty. But hear me out! Let’s take a look at a few facts about the set I recommend, and then I’ll explain what exactly makes the Digital systems so, SOOO much better than the Carrera GO systems. 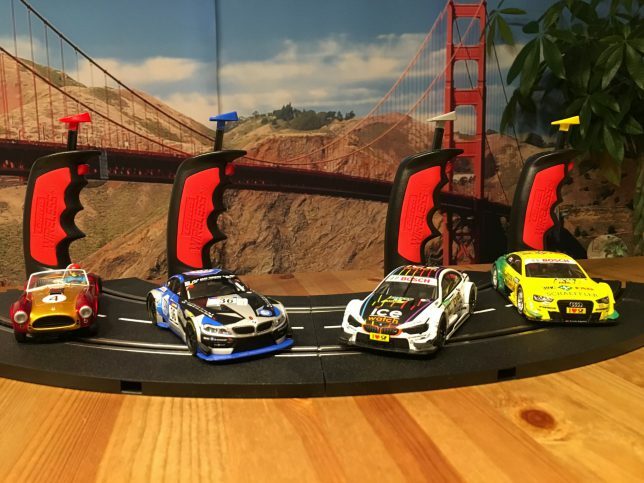 What makes Carrera Slot Car Sets from the Digital 132 series so good for kids? This is the most important reason: The Carrera Digital systems allow you to limit the car’s top speed in 10 steps. From “very slow” (level 1) to “max speed” (level 10). This can be done either through the app or directly via the control unit. Setting up the speed limiter could not be easier! 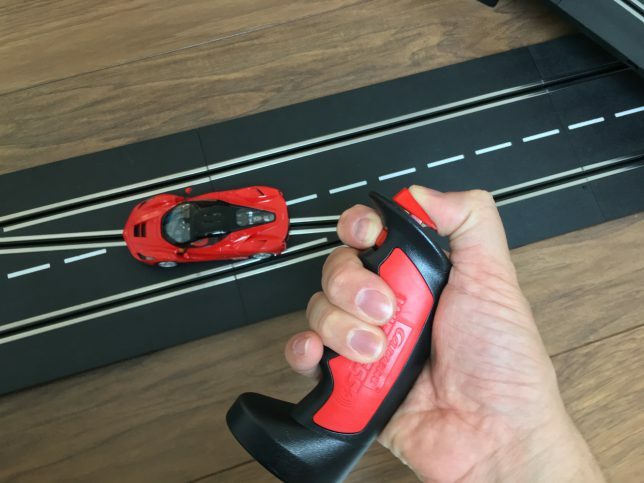 Analog systems, like the Carrera GO, do NOT offer such a feature, though it is so important if you want to race slot cars with your kids: You really need to make sure that kids, who will most likely simply press the button on the remote control all the way down, without ever letting go, will be able to keep their cars on the track. 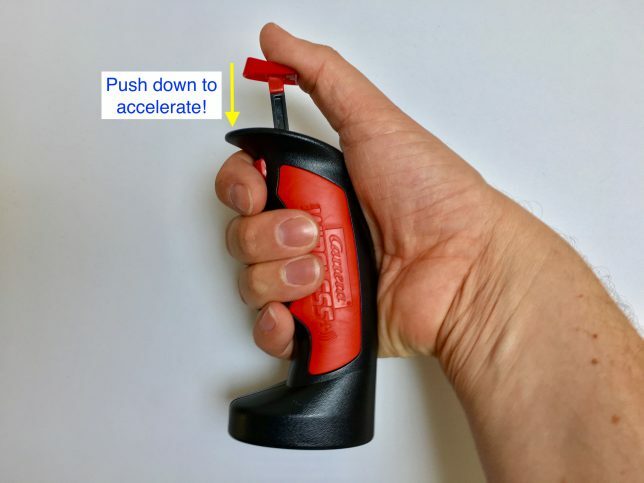 If a slot car goes at top speed and enters a corner without slowing down, it WILL fly off the track. That is why I am going to say: Even though Carrera is marketing their Carrera GO sets specifically to children, they are by FAR not the best option! The Digital sets offer that BIG advantage: Being able to limit the top speed keeps your kids motivated because the level 1 setting of the speed limiter allows you to hold the car on the track without ever letting go of the accelerator. That’s great for kids! Here’s the kicker: Different cars can have different speed limiter setting at the same time. That means that you can set your own car up for higher speeds (and thus making it more challenging) while your kids can run their cars at a save speed. That doesn’t even give you an unfair advantage, because you, having the faster car, have to drive much more carefully now. If you happen to “deslot” and fly off the track, you will lose lots of time and your kids WILL catch up! 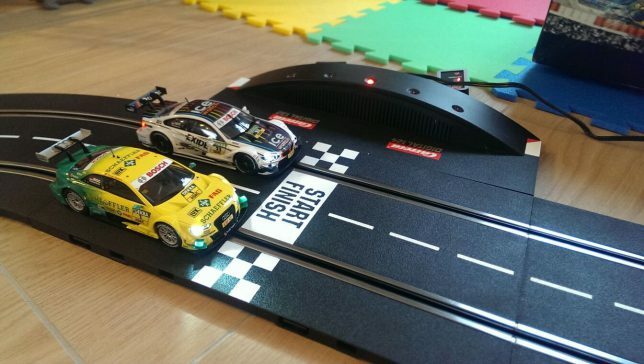 The speed limiter is also great when you have family visiting (on Christmas, for example) and you want to introduce your own dad or brother to slot car racing! Carrera Digital 132 system components (tracks, cars, accessories) are beyond “toys”. They are high-quality products. They will last for years to come and grow with your child: You can expand the system by buying new track parts, new cars and race track accessories (like grandstands, pit lanes etc.). You can even connect the system to your smartphone or tablet via Bluetooth! Let’s compare that to the Carrera GO series: It’s price point and quality both say “Hey, I am a toy!” – It’s nothing more than that. Its lower material and processing quality, fewer details and smaller size reflect its cheap pricetag. And in terms of technology and expandability, it can simply not hold up to the much more serious Digital 132 series. The price tag is higher, but your kid will enjoy the race track for years to come. In my opinion, that makes the initial investment well worth it. And if you ever happen to sell the racetrack on eBay or the like, the better product quality will also pay off in terms of a very good value retention. I get that! I’ve been there. But there is no reason to be worried. Because here is something really, really cool: Carrera was smart enough to design their slot car models in a “modular” way. What I mean by that is that Carrera sells these beautiful cars with all those small details. They are great to look at when you have them on display. However, they are aware of the fact that slot car races are intense. At speed level 10 these cars can make up to 20 mph! And at that speed, flying off the track or colliding with another car could seriously damage the car, in terms of making these little details (mirrors, spoilers etc.) snap. What Carrera did is they designed their cars so that you can simply take off those small parts from your cars. And here we are in “racing mode” (or toddler mode): All the small parts are removed and can be stored safely. When you’re racing, you remove the small parts and your cars are less fragile. When you put them back on the shelf, you can bring back all the details! In our specific scenario, you can also take off those small parts for good and store them somewhere else, so that your toddler cannot get ahold of them. That way, there are no small parts to swallow. Finally, Carrera holds official licenses not only from well-known car manufacturers (such as BMW, Mercedes, Ferrari and Porsche) but also from entertainment companies such as Disney. So besides models of real sports cars (even Formula 1 cars), there are special “cartoonish” cars available, like Lightning McQueen for example. Impressive, right? The digital system allows you to let up to six cars to race at the same time. Even if your track has only two lanes. Provided you have enough cars and controllers, this leads to intense racing action. Seeing six adults running around the track, trying to get their deslotted cars back on track and (kindly) yelling at each other is super funny to watch, especially for the younger ones! The button on the front of the controller allows you to trigger switches. That way you can change lanes and overtake others! This is a really great feature, as it allows you to enjoy the race track, even if you’re alone: Sets from the Carrera Digital 132 series allow you to setup a ghost car that will race around the track all by itself. Then you can take a second car that you control and race against it! That’s awesome!!! Okay, a 300 dollar pricetag is a hard pill to swallow, I get that. And I understand that you’d like to know what is inside the box before you buy, right? So let’s take a look at what you’re getting. The control unit is the entire tracks “brain”. 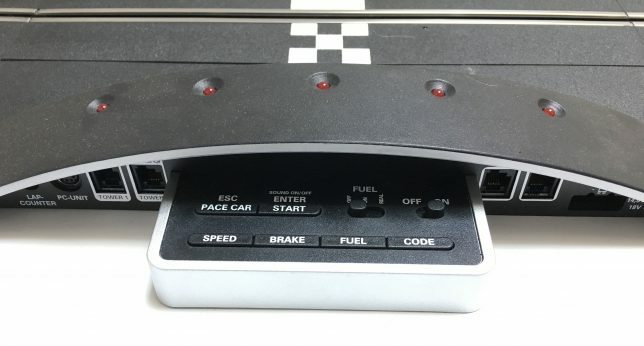 It connects the track to power and your control inputs to the cars. It also has all the logic stored in it to control the race etc. 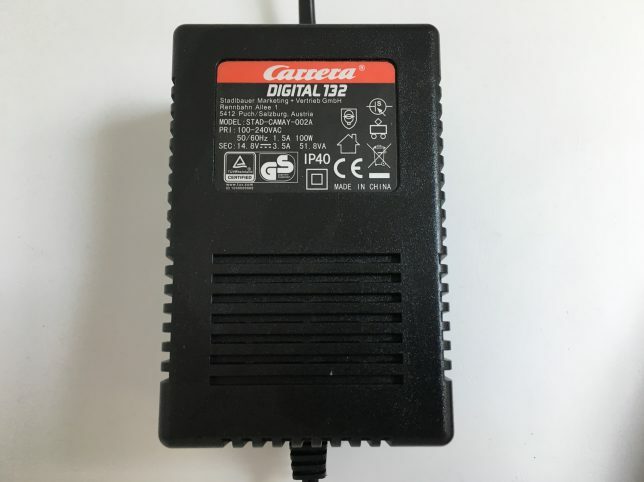 Modern Carrera Digital 132 sets come with 2.4 GHz wireless controllers. Usually, there is one for each car that’s in the box. 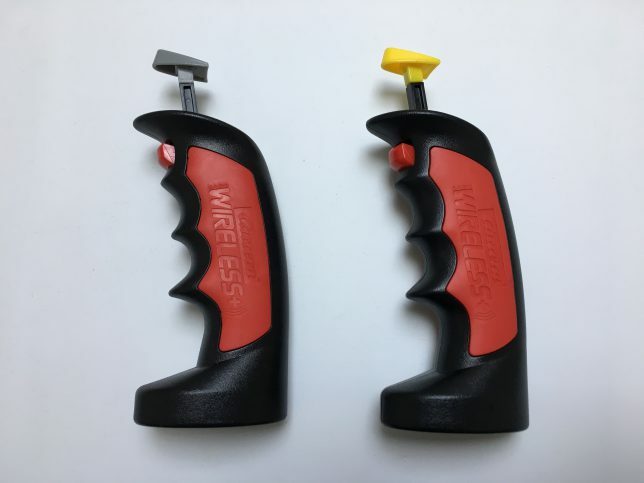 The Wireless Controllers are included as well. The sets come with one for each car and the Lithium batteries ARE included! The included charger connects to the control unit. Simply place your controllers here when you are done racing to recharge. Connects to the Control Unit and provides a wireless interface for your controllers to connect to. 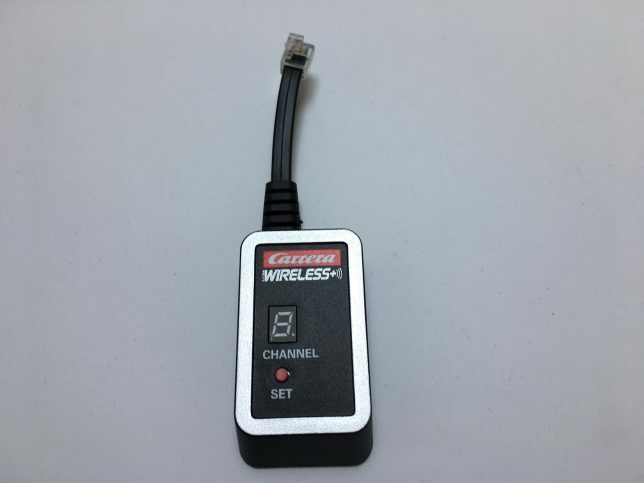 The wireless adaptor assigns your controller a channel and connects them with the control unit. Provides power to the system. Here you see the European power supply. US systems come with a 110 V system with a US power chord, obviously. Depending on the set your buying there are two or three cars in the box. The boxes are all themed and the car selection is based upon that. In our set, there was a BMW M3 and an Audi A4. There are usually a bunch of straights as well as corner elements included. 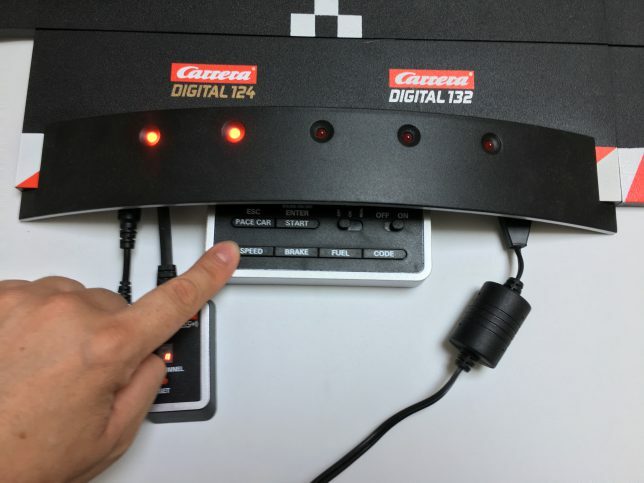 Carrera Digital 132 sets also come with one or more intersection parts that allow you to switch lanes, which can be triggered by pushing a button on the controller. These go underneath the track elements and help to keep them in place. I highly recommend to use them. Otherwise, your track may fall apart. Nothing you want to see happen during an intense race! Use track connectors to interlock the individual track elements with each other. These are also important, as they help to keep your cars on track (very helpful, indeed) and also prevent your cars flying through the entire room if you happen to deslot! Tires worn off? What About Support And Spare Parts? Carrera race tracks is an action toy. And when action is involved, things might break. Even if your really careful you will see that after a while you might need spare parts. One example would be new tires, as they can wear off after a while, just like real cars (this takes quite some time, though). So what about spare parts and support? I’m gonna say: Carrera’s support and service are really, really excellent. Besides having an entire support section of their website dedicated to this, they also offer a service hotline that you can call if you need more in-depth support. You can purchase spare parts for any system or car they released and that support is there for years, even if that specific product was discontinued years ago! I am happy with my purchase decision. Benni I spend a lot of time letting these beautiful designed model cars run around that track. And I can really see how he’s getting better at it. We’re almost at the point now where I can increase the speed limiter on Benni’s car from level 1 to level 2, which is really great! Not only does the system grow with your child, but I can see how the racetrack makes my son grow, if that makes sense: He’s learning, getting better and he develops new skills. And at the same time we have lots and lots of fun! Together! That’s awesome! Please do not let the high price point scare you away. Yes, the initial investment is high. New cars, track parts etc. aren’t cheap either. But the system will really, really add value to your family life and give you lots of opportunities to spend time together. And as such it will pay off! I usually say that good toys do not necessarily have to be expensive. And that’s still true! This one here, however, is one of the examples where I am happy that I have made the decision to pay the higher price in exchange for a high-quality product that my son and I can enjoy for years to come! Here we are. 2900 words later! Thanks for sticking with me and spending your precious time on my blog. I really, really appreciate it and I hope I could give you the information you came here for. If you have any question or want to add anything to the story, please leave a comment below or email me through chris@ThatToyDad.com. I’ll respond! Pinky promise! I really enjoyed reading that article! It took me back to my childhood, on the rare occasions that my Uncle would let me play with him and his spot cars. This was a really old set with more of a gun type trigger. I wish I knew the name of the set. I can still remember the sound of the cars going around and around the track. how cool that your uncle let you play with his slot cars back in the days. Besides Carrera, there is another “big player” named Scalectrix. Maybe it was a slot car set made by them? The gun-type triggers are actually still quite popular among the “pros” and enthusiasts! Many pay a good amount of money for a high-quality gun type trigger! Is the Lightning McQueen named after Steve McQueen? Really interesting stuff. But, did you know big men don’t outgrow the kid in them? To Benni work and play are the same, because for kids play is work. For you however, it’s just the kid in you who just wants to play with toy cars. LOL. My kids are all grown. All professionals. But I did have fun with my kids when they were small. We were into toy trains. Needs a lot of space. You can’t have fun with these things in a cramped situation. I can see though you are one hell of a Dad. Continue to have fun with Benni, Chris. You still have a lot of years for parenting. Enjoy being a Dad. It’s really great being a Dad! Thanks a lot for reading my article and taking the time to leave a comment! That is awesome!!! Lightning McQueen is a fictional character from the Disney Movie Cars, but you are right: According to Wikipedia the character is actually named after Steve McQueen! Thanks for the advice, man, I really appreciate it: I definitely enjoy being a Dad! It’s great, and I love every part of it 🙂 !